If you are like me, you have spent the last few months dedicating your entire life to getting prepared for Christmas. With all of the decorating, shopping, present wrapping, signing Christmas cards, and baking, now that the big day is over you just want to unwind. With all of those New Year’s Eve celebrations that are coming up, however, you’ve still got a few things left to do. Since you can’t possibly attend all of your friends’ and family members’ parties, have your own celebration, and maintain your sanity, you are going to need to come up with something special to ensure that your loved ones enjoy themselves as they welcome 2015. Of course, you could always head right back into the kitchen and start whipping up some homemade candy, but who has the time and energy for that right now? Or you could swing by the liquor store and pick up a few bottles of expensive champagne, but have you seen the price tag on alcohol these days? And besides, with either of those choices you are still going to have to worry about shipping costs or hand delivering your gifts. Sometimes it seems like it’s just not worth the trouble. Before you give up all together, however, grab a glass of eggnog and I’ll show you a better option. Shari’s Berries offers a wide variety of delectable delights that will make the perfect addition to any New Year’s Eve celebration, and the Holiday Mini Cookies are just what you need to get the party started. With an assortment of 30 beautifully decorated cookies, there are plenty to go around, and the holiday designs are the perfect touch to bring some cheer to the New Year. The best part about these Holiday Mini Cookies is that you can have them delivered right to your loved one’s home or office, so you won’t need to worry about expensive packaging, shipping rates, or freshness. Order yours today to ensure delivery by the New Year, and don’t forget to order an assortment for your own New Year’s Eve celebration as well. 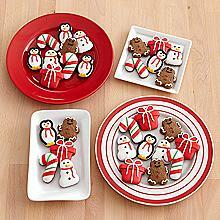 The Holiday Mini Cookies assortment includes a variety of hand decorated creations such as: 6 unique gingerbread boy cookies, 6 festive Christmas present cookies, 6 colorful candy cane cookies, 6 cheery snowman cookies, and 6 precious penguins so there are plenty for sharing, and the gift is even placed in a decorative holiday gift box that makes it perfect for sending to loved ones who live far away. Since these cookies are affordably priced at just $24.99, you can order an assortment for all of your friends and family members to help them bring in the New Year. 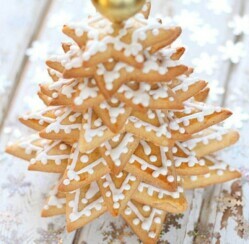 What are your favorite holiday candies and cookies? Do you make them homemade or do you order them to be delivered? Have you ever had a bad experience with cookies that you purchased from your local bakery?